Mrs. Willa Rae Patten, 90 of Gainesville passed away Friday August 17, 2018 at the Northeast Georgia Medical Center. Funeral services are scheduled for Sunday, August 19, 2018 at 3:00 p.m. in the chapel of Little & Davenport Funeral Home. Rev. Geoff Grubbs and Rev. Jamey Prickett will officiate. Interment will follow in the Alta Vista Cemetery. The family will receive friends from 1:00 p.m. to 3:00 p.m. prior to the service. Mrs. Patten was born October 12, 1927 in Arcadia, Kansas. 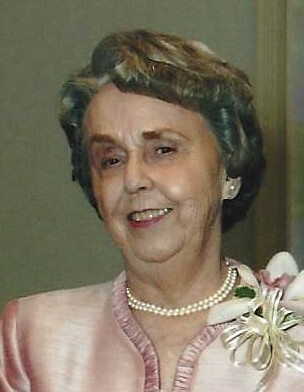 She was the daughter of the late Lawrence and Opal Gray. She was married 67 years to the late Robert Patten. In addition to her parents and husband, she is preceded in death by her brothers and sisters-in-law, Rollin Gray, Charles Gray, Jack and Jean Gray and Joe and Lucy Gray. Mrs. Patten came to Gainesville in the 1950's with her husband where she was a homemaker. She was an active member of St. Paul United Methodist Church, where she enjoyed teaching Sunday School classes. She also spent her time serving with the Camp Fire Girls, the Boy Scouts, and room mother for her children's elementary school. Mrs. Patten enjoyed traveling with her husband and the Prime Timers. She was an avid Bridge player. Mrs. Patten is survived by her daughter, Pam Bowen of Cornelia; son, Brian Patten of Gainesville; daughter and son-in-law, Debbie and Chuck Walls of Gainesville; son and daughter-in-law, Brad and Jennifer Patten of Gainesville; daughter, Nancy Pate, Acworth, eleven grandchildren, ten great grandchildren and her nephew, Billy Graye. The family would like to extend a heartfelt thank you to Judy, Crystal, Beth, Maria, Victoria and the Bright Star Staff at Holbrook. A special thank you to Trudy for her kindness and care for our mother over the years. In lieu of flowers, the family asks the remembrances be sent to St. Paul United Methodist Church, 404 Washington Street, Gainesville, Ga. 30501.